Ship Notes: In Stock! Free Shipping, No Delivery Charge! Proven Design, High Performance and Durabilety. 3-Speeds, Stackable. NEW Air Mover and Fast Free Shipping via FedEx! Power that Saves Time. This High Velocity Air Mover offers the performance needed to dry carpets and floors fast. 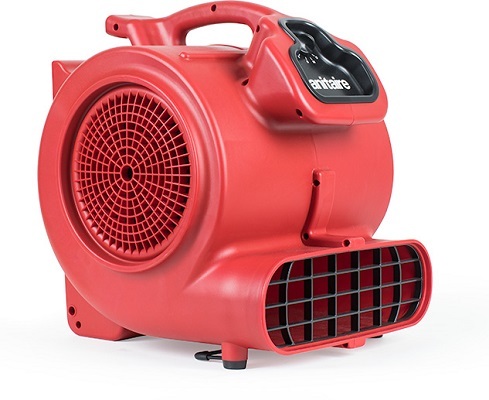 Sanitaire Air Movers significantly reduce drying time on a variety of surfaces. This air mover has the performance and durability to dry carpets and floor fast. A 3-speed switch lets you control the air speed while the built-in handle and stackable design make portability and storage convenient. The 0.62 HP Motor makes them ideal for carpet drying and restoration projects. Maneuverable and powerful, this High Velocity Air Mover offers the performance and durability to dry carpets and floors fast. The 3-speed control switch lets you adjust the air speed to meet your drying needs from a maximum air velocity of 3758 ft./min. down to 2700 ft./min. The stackable design and small footprint make it easy to store up to 4 High Velocity Air Movers in a small closet or the corner of a room. Click Below for User Manual and Repair Parts.